So you think you might be attending your first gallery opening, and you’re not quite sure what to expect? Wipe the sweat from your forehead, get a tissue for your clammy hands, and breathe a deep sign of relief for I am here to help you. Yes, sometimes when we think about going to a gallery it feels intimidating. We don’t know enough big words about art, don’t know much about art history and we feel the pressure to come up with all the right observations and opinions when it’s time to make conversation. But I don’t think you will find these expectations at most galleries. 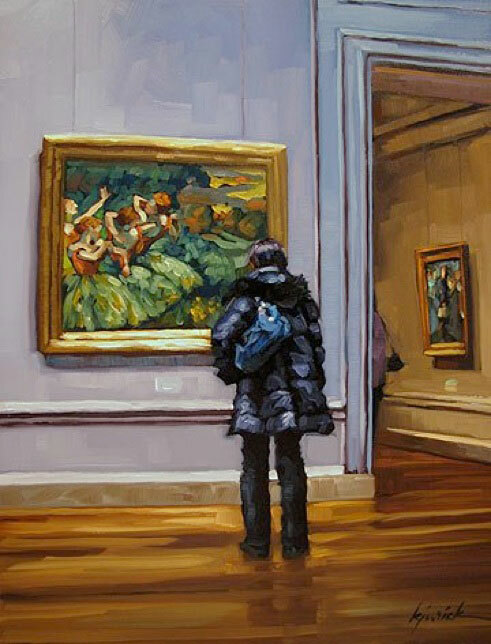 • A large group of people moving around a room viewing art. • Sometimes there is live music. • Light refreshments are usually served. • You may see the gallery director making guests comfortable and being available for any questions or sales. • The artists will usually be present and the well known ones will probably be in a perpetual conversation. You will find people who genuinely love art, love to create it and love to talk about it. That’s where you come in. You don’t have to know a lot and you certainly don’t have to put on a front of art history knowledge. Art is meant to be enjoyed, discussed and felt. And if you’re new to this, there’s no shame at all. You just need to observe, ask any questions you have, form your opinions, and enjoy. As an introvert, I appreciate getting questions of all sorts to help me get talking. No question is silly and I love talking about the process so ask away! There are a few common sense rules that I will list here, but I’ll try not to give you too many because the goal is for you to enjoy yourself. Dress: Somewhere in the middle of jeans and a T-shirt and a suit and tie is the appropriate dress for most galleries. You don’t have to be fancy, just don’t be slovenly. Be considerate of your phone use. You might want to take phone calls outside. It may be encouraged to take pictures of friends and perhaps with an artist, especially if you plan to post pictures on social media bringing attention to the gallery. When in doubt you can always ask. Enjoy some art and then the snackies. Please respect the paintings, sculpture, and glass by keeping a reasonable distance. 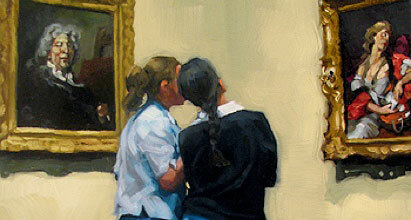 It’s best not to touch or get too close to art that you don’t own. If you want to lean in and look at a detail, that’s understandable. Step in and take in the whole space, noting the flow of traffic and the direction you would like to proceed. 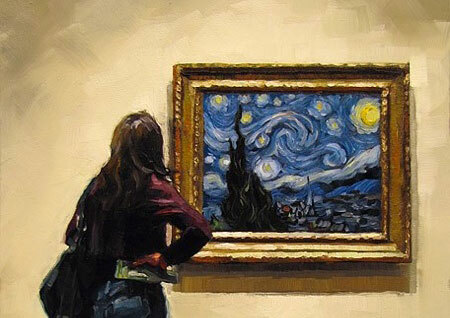 Begin observing the art. Making note of how you feel about the artwork. Do you like it? Why or why not? See if you can find something positive to say. See if you can find out something about the artist. There are usually statements or bios nearby. Hunt for at least one piece of art that you like the most. Or, if it’s a group show, figure out who your favorite artist is. Hypothetically, If you could buy a painting which painting would it be? Do you have questions about how the art is created? The subject matter? If you feel up to it, ask the director if they can point the artist out to you so you can ask your questions. Again, artists love to talk about their craft. Don’t be afraid or intimidated. I hope this little lesson will help you as you venture out into the art world. 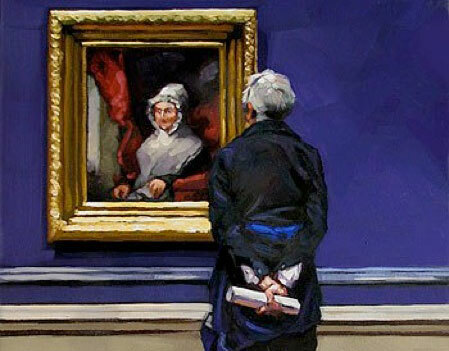 As far as I’m concerned art appreciation can be as simple as enjoying something that you’re seeing. If you don’t have plans to attend a gallery opening, then make some. It makes for a great date night accessory in the middle of dinner and dessert. Bring some friends and talk about the show over something drippy and chocolatey. Want more of Karin’s gorgeous paintings? This entry was posted in Art Assistance, The Artist's Life and tagged Discoveries, galleries. Bookmark the permalink. Sorry I wasn’t able to talk longer with you at the opening but many congratulations to you. I really enjoyed this guide to openings. Would it be okay to reproduce this on the West End blog, illustrated with your work? It’s such a well written and thought out piece, I think that would be a good way of introducing yourself to the clients and other artists who read it. Let me know! Congratulations from you means a lot, thank you. I would be honored for this to appear on West End’s blog. I would like to email you about it – but I can’t seem to find a way to contact you on your blog or site – I’m sure I’m just missing it. Can you send me a link, or contact me here?